New Hampshire enjoys one of the lowest unemployment rates in the nation, standing at just 2.6%. Both the US and NH economies have been on a steady uptick since 2010, after a very rough period from 2007 through 2009. With this growth, New Hampshire's employment ranks have increased, with total employment rising from 596,000 in 2010, to 653,000 in 2017. Interestingly, of the 57,000 new workers in New Hampshire during this period, 44,000 have come from the the 55 and over age group, representing 77% of the total growth in NH's employed. With such, NH's 55 and over workforce now represents 1 in 4 (25%+) of all NH employees. 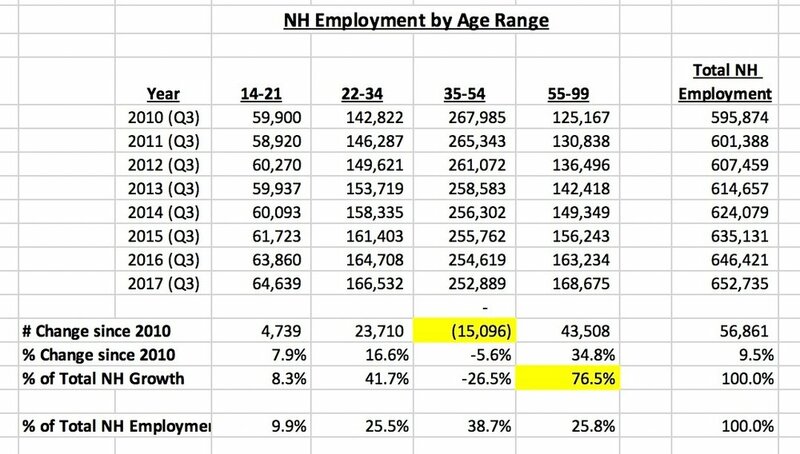 Conversely, during this same period, NH employment in the 35 to 54 age demographic has seen its numbers fall from 268,000 to 253,000, a 5.6% decline, during this same period. People are just living longer, and with such, are working longer. The financial crash of 2007-2009 is forcing people to work well into their 60's. Baby boomers constitute a larger portion of the population. NH-based companies and institutions are attracting more senior-aged workers. NH is a viewed as a good pre-retirement locale for an older generation. The list above may help explain why the 55 and over crowd is growing so rapidly in New Hampshire, but one has to wonder why the 35 to 54 age group is seeing its numbers diminish.